Here’s how to create an event — referred to as (well, yeah) an “event” — on your Samsung Galaxy S8 phone. Start from one of the calendar displays. Tap the bright green circle with the plus (+) sign at the bottom right of the calendar. Doing so brings up the pop-up screen shown here (without the keyboard). The only required information to get things started is a memorable event name and the Start and End times. Calendar: Decide on which calendar you want to keep this event. The fogire shows that this event will be stored on the Gmail calendar. This is indicated by showing my Gmail account next to the blue dot in the middle of the screen. When you tap this selection, the phone presents you with the other calendars you’ve synced to your phone; you can store an event on any of them. Title: Call the event something descriptive so that you can remember what it is without having to open it up. Start and End: The two entry fields for the start and end times. Select the All Day toggle if the event is a full-day event. Notification: This field lets you set how soon before an event your phone will alert you that you have an upcoming event. This makes it less likely that you’ll be late to an appointment if you set this alert to accommodate your travel time. Location: This setting ties in to the Google Maps app, allowing you to enter an address or a landmark. You can also just enter text. Invitees: This allows you to have a group meeting by entering multiple contacts. Notes: Add information that you find useful about that meeting. Privacy: This is the same idea as the Show Me As option, but for non-Outlook-based calendars. Time zone: If you and everyone that is invited will be in the same time zone, you are set. If you happen to be in another time zone or some of the invitees are in other time zones, you can use this option to ensure that you are not setting a meeting off business hours, or worse, in the middle of the night. After you fill in the obligatory (and any optional) fields and settings, tap the Save link at the top of the page. 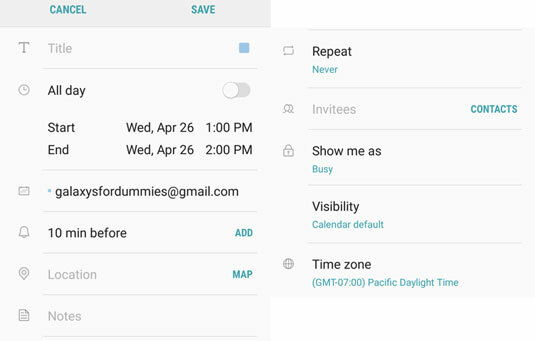 The event is stored in whichever calendar you selected when you sync. Edit: Open the event by tapping it from within one of the calendar views. This brings up the information as entered. Make your changes and tap Save. It’s changed when it syncs. 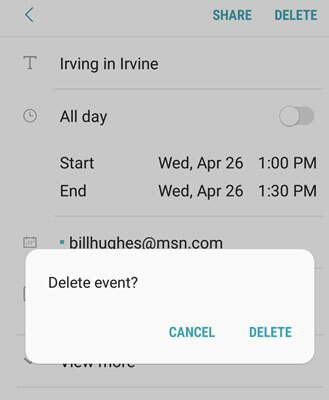 Delete: To delete an event, start by tapping the entry on the screen. Tap the green Delete link at the top left. This brings up the pop-up as seen here to delete the event. Tap Delete. The event is gone. The Delete Event pop-up screen. You can also create an event by tapping the calendar itself twice. Tapping it twice brings up a pop-up where you can enter the event details.